The interactive map in Red Hook WaterStories combines a land map and a chart (a mariners' map of what's in the water). If you are not familiar with charts, the information below explains the numbers, colors and names in the waterspace. This “chart” of the harbor around Red Hook is produced and updated by NOAA (National Oceanographic and Atmospheric Administration). NOAA started charting U.S. waters back in 1807. Charts are issued in many formats, visual and electronic. This chart is adapted from NOAA Chart No. 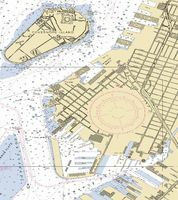 12334, "New York Harbor Upper Bay and Narrows", which includes a lot of descriptive information; a full description of chart keys is provided in NOAA Chart No. 1. Modern maritime navigation equipment uses electronic charts, which carry far more information than the paper charts; take a look online at same same area's electonic chart. The Automatic Identification System (AIS) is a system for identifying and locating tugs, ferries and other vessels by exchanging data with other nearby ships, AIS base stations, and satellites. AIS shows the ship's name, position, heading, speed and much more. Note that one of the big maritime uses in Red Hook does not carry an AIS - barges. More info on AIS at Wikipedia. Speed is shown in knots. Knots are nautical miles per hour. Mariners used to measure their ship's speed by throwing a log line: a piece of wood or other floatable object over the vessel’s bow then counting the amount of time before its stern passed the object. Marine Traffic has very generously provided their AIS data stream to show real-time ship movements around Red Hook on the WaterStories map. If you click on a ship's icon (a blue ▲), you can get information on the ship's flag, type, course and speed, plus a link to much more information on the ship from Marine Traffic. Note that not all vessels broadcast their details via AIS; in particular, most barges do not register on AIS. The numbers on the chart are depth soundings, measured in feet, showing the water depth at low tide. Buoys appear on the chart as a magenta circle with a red or green diamond. The text next to the icon indicates with “G” (green) or “R” (red) and their number, e.g. “9”. Red buoys (“nuns”) have a conical top, even numbers, and indicate to keep them on your right (starboard) as you are returning to harbor; the pneumonic “red right returning” helps to remember this. Green buoys (“cans”) have a cylindrical shape, odd numbers, and indicate to keep them to your left (port) as you are returning to harbor. Buoys can make noise, carrying bells, gongs, or whistles. “Fl G 4s” means that the buoy has a Green light that flashes every 4 seconds. “Q” means the light flashes quickly. ISO is for isophase, which means it repeats on and off in equal duration. Like 1 second on, 1 second off. Special purpose markers are Yellow and warn of a variety of items, including anchorages, dredging, fish trap areas, or Military exercise areas. The west side of the Gowanus Flats has a yellow buoy “Bay Ridge Channel Anchorage Lighted Buoy A”. A light, such as the one at the tip of Erie Basin, shows what color the light is, how often it flashes, and the height of the light above the water. That light is mounted on top of a red lateral beacon (a post), with a red flash every 2.5 seconds. Range markers show the center line of a channel by having them lined up as you pass through the channel. There are some range lights right by the Brooklyn Cruise terminal. These are two tall patterned markers that a ship’s captain uses to visually line up approach to a destination. On the chart there’s a dotted line leading out from the range lights; if a ship is on the line, the markers will visually line up. Range Markers are found in pairs with one higher than the other. They have vertical colored panels to assist you in lining them up. One big thing you see in the waters off Red Hook are boats at anchor or on a mooring. An anchorage is a government designated area where ships can anchor. They show on a chart with an anchor icon or the word “Anchorage”. Anchorage No. 21A is just off Erie Basin. Details on use of anchorages is covered in Coast Pilot No. 2 (2016/45th Edition), pp. 345-372. A Mooring is like an anchor that is not attached to a ship. A mooring has a heavy weight on the bottom of the harbor, attached by chain to a float. A ship picks up the float and ties to the chain to temporarily stay in a location. Multiple moorings can be together in a Mooring Field. Indicated on the chart as “Dols” or “Subm dols”, “dolphins” are several pilings that are lashed together. “Obstn” is an underwater obstruction. They are surrounded with dotted circles and show the depth of the obstruction. “Ruins” with dotted line boundaries show bigger obstructions. Squiggly magenta lines indicate underwater cables, and may also say “Submcable”. You do not want to anchor dredge where there are cables, power lines, or pipes. Bulkhead – a maritime word for a wall, either a wall in a ship or a retaining wall that makes a hard vertical edge between land and water (rather than a sloping beach). Such in-water bulkheads are often used to make places where ships can dock. The bulkhead is put out in deep water and landfill put behind it (bring land out into the water), or the bulkhead is installed in shallower water and the land/mud under water is dredged (dug) out to make a berth that is deep enough for ships to dock. Bulkhead line – the line defined by the bulkhead(s) in the water. The federal government also declares “pier and bulkhead lines” as limits beyond which nothing could be built out into the water. Pier/dock - a structure built on posts (pilings) extending from land out over water. Pierhead – the pierhead is the part sticking out furthest from the land into the water. The inshore end is the part of the pier closest to land. Berth – essentially the parking space of a ship at the pier, dock or wharf. The ship has a berth at a pier. “Landing” is similarly used for a berth. Wharf – similar to a pier or dock, though it may be a solid landmass not a structure built on posts (pilings). Basin – a man-made cove or protected waterspace to use for docking ships. Red Hook has two basins: Atlantic Basin and Erie Basin. On the left, currents are shown at The Verrazano Narrows (the closest location providing data). "Current" describes what direction the water is flowing, and at what speed. The direction of the "flood" on this table is 314°; the "ebb" is the opposite: 134°. "Slack" means when there is little or no current. 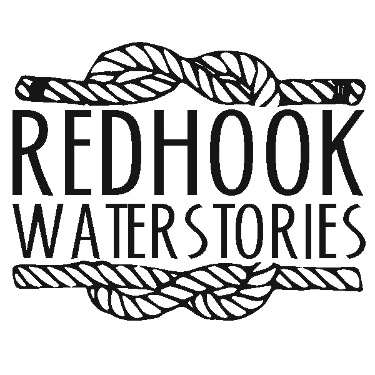 From Red Hook, you can visibly see the current in a few ways. Buoys will tilt in the direction of the current. If you see ships on moorings, they align with a stronger current; at slack tide, their orientation may be more affected by wind direction. And tugs with barges often time their runs to travel with the current. On the right, tide levels are shown at the Battery (the southern tip of Manhattan, and the closest observation point to Red Hook). Robbins Reef (Station ROBN4) is the closest NOAA buoy to Red Hook that records wind conditions. It is located at the Robbins Reef Lighthouse, off the coast of Bayonne, NJ (40°39'26" N 74°3'55" W). 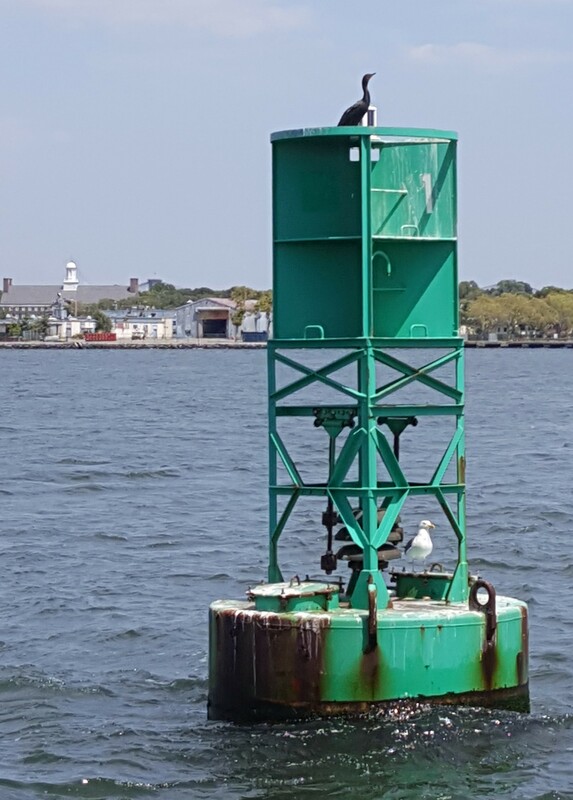 "Aids to Navigation", also described by Boat U.S.
Stevens Institute's Davidson Laboratory and Center for Coastal Resilience & Urban eXcellence (CRUX) has tremendous resources on the harbor.